Improved Initiative: Improve Your Combat Roleplaying With Combat Description Cards From Conflict Games LLC. 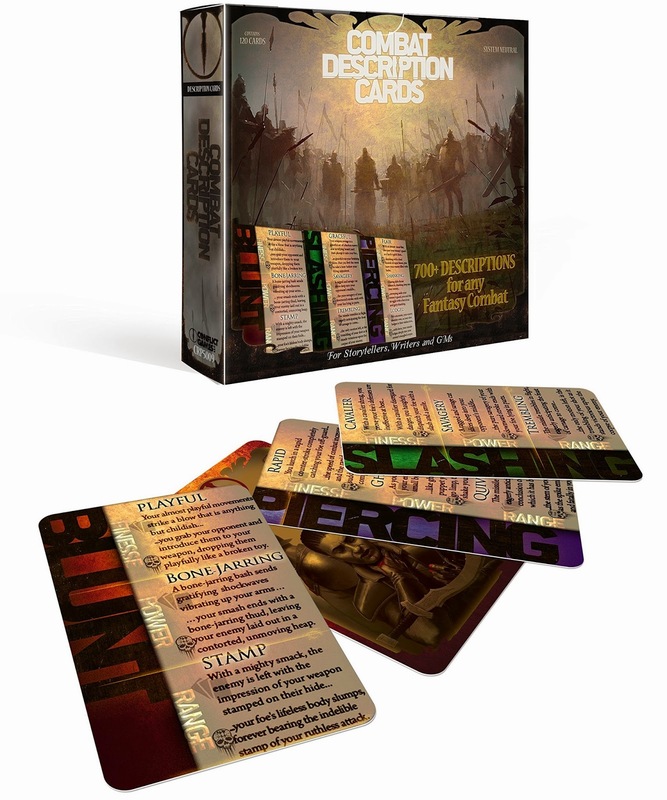 Improve Your Combat Roleplaying With Combat Description Cards From Conflict Games LLC. Regular blog readers likely caught my recent post How To Roleplay During Combat, where I laid out a series of suggestions for improving roleplay during your initiative order. The post got a big response from players across a variety of games, but one of the most common points that was made was that not all players are capable of pulling out vivid descriptions on command. That's a valid point. In response to this point though I'd like to point out that these exist. What you're looking at are Combat Description Cards from Conflict Games LLC. These cards are, simply put, a randomizer that allows players to always have something clever on hand when they manage to land a blow. Whether they're ranged fighters, power fighters, or finesse fighters, and whether they're using blunt, slashing, or piercing weapons there is something here for everyone. Except magic users... because you already have descriptions in the book for what your spells look like. If you'd like to support Improved Initiative so I can keep bringing you the latest and greatest in gaming posts and news then stop by The Literary Mercenary's Patreon page and become a patron today! Also if you want to get all of my updates then make sure you follow me on Facebook and Tumblr so you don't get left out of the loop.